As we pushed our way into the convention hall the first morning and one of the first things my friend and I came across was the Capcom booth. There was Lost Planet 3, with only a few people in line. We thought "why the hell not" and got in line. Unfortunately, the demo was about 25 minutes long and my feet were exploding by the time it was over. But, hey, at least I got a t-shirt, right? Anyway, I ended up with a PS3 version which displeased me greatly because 1) I don't own a PS3 and 2) I hate the damn controller. I struggled to get a hang of the controls, but the game felt pretty good overall. At least, I imagine it would play pretty well if I had an Xbox controller. It was very apparent from the start that new developer Spark Unlimited threw out everything built by Lost Planet 2. This is a very good thing. Lost Planet 2 was one of the worst sequels I've ever played and an all around bad game. In this prequel, you play as Jim, a colonist who has come to EDN 3 in search of mining work. It struck me how much I got the know the character in just 25 minutes. Jim is a person, not just a generic soldier, who has a family back on Earth that he cares for very much. The gameplay was spliced up by cutscenes that provided you with Jim's backstory and showed off his personality. In short, this aspect really impressed me. Maybe it was Capcom's intention to pass the series off to a Western developer in order to flesh out the series story. They've done this with both Dead Rising and Devil May Cry. Pretty survival-horror-y. Thermal energy was present, but did not deplete in the demo I played. That'll really provide a survival-horror feeling! The gameplay itself was more or less what you'd expect. For the most part, it played like the first game. You shoot, you grapple, you dodge. There was this one kind of quick time event that popped up a couple of times when I was jumped by enemies that required me to center my reticule and stab creatures in the face. In fact, it was something that plays into my next point. The mood of the game is very different. I got almost a survival horor feel from it. Not necessarily a bad thing, since the second game had no personality. It's obvious that this is an alien world to Jack, and he's not used to encountering the Akrid. In one section, I had to enter a cave to plant a thermal beacon and ready the area for mining. Once activated, it melted the snow and revealed a half-frozen laboratory. The lighting effects and enemy encounters (little guys that scurried into the shadows) really hammered home that horror feel. Honestly, I've been having a hard time keeping Lost Planet 3 straight from Dead Space 3. You know, because of the whole former miner turned survivor on a frozen planet thing. What really sets the game apart from both its predecessors and Dead Space is the rig. In Lost Planet 3, you can no longer pilot mechs around. Being a prequel, nobody's invented them yet. Instead you get a huge robotic mining rig. The demo had two boss fights against giant crab things. One was on foot and the other was in the rig. The on foot fight was basically what you'd expect. Roll dodge, shoot in glowing orange spots, repeat. But the fight in the rig was something different entirely. Gone are the intense, fast-paced mech battles of the first Lost Planet. Instead was a Punch Out inspired, brutal one-on-one duel in which timing was everything. I had to grab the crab's arm with my claw, then twist to reveal its weak spot which I cut off with my drill. Countering at the right moment allowed me to pin the creature and drill into its soft, fleshy back. Drilling giant enemy crabs in first person using the rig. Attack it's weak point for massive damage! 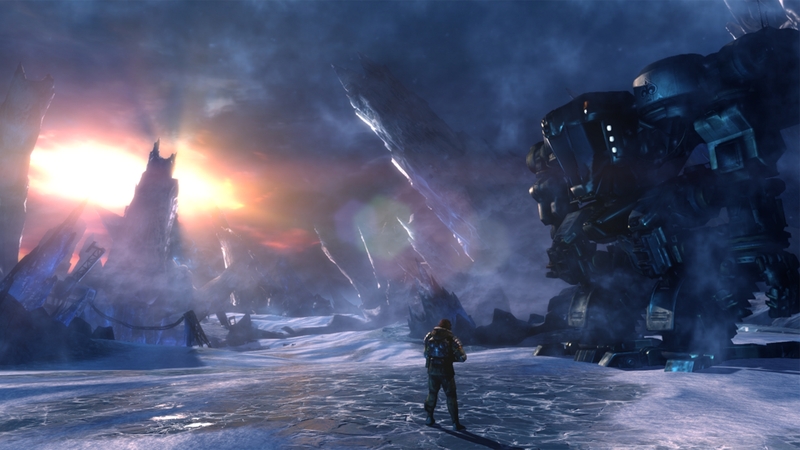 Lost Planet 3 releases sometime in 2013, and I'd keep an eye out. It might turn into a sleeper hit. At the very least, it's a step in the right direction.